In many industrial facilities, various pieces of equipment, as well as many fluids used in process systems need to be cooled. This cooling is mostly done with water. However, as cooling water is used, it absorbs heat, and loses its cooling effectiveness. The water needs to be kept cool. Disposing of hot water in to ponds or basins can be detrimental to the environment. It’s also costly to replace the discharged water. The more efficient means is to cool the hot water and reuse it. The equipment most commonly used to do this is the cooling tower. Cooling towers are part of a cooling water system in a commercial or industrial facility. The main components of a typical cooling tower are a circulating pump, a shell and tube heat exchanger, and fluid lines. In the heat exchanger, heat from a process fluid is transferred to the cooling water. After absorbing heat from the process fluid, water flows from the heat exchanger to the top of the cooling tower. The water then falls through the tower and is exposed to air, which in-turn, cools the water. The cooled water collects at the bottom of the tower and is pumped back through the system for reuse. Cooling towers cool water by exposing it to air, which causes some of the water to evaporate. Evaporation is a process in which the heat contained in the water causes part of a water to turn to vapor. As the water turns to vapor, the heat is removed, resulting in cooled water. In a cooling tower, the heat that was contained in the water is removed from the tower in the vapor as the water evaporates. Conduction and convection play an important role in a cooling tower. In the tower, water comes into direct contact with the air. When this occurs, some of the heat in the water is transferred to the air directly by conduction and convection. All cooling towers basically operate on the same principles, however, their designs can be divided into two categories - natural draft towers and mechanical draft towers. Draft refers to the flow of air through the tower. Air flows through the unit naturally without help from mechanical devices in a natural draft tower. As the water evaporates, the air inside the tower becomes warmer and less dense than the air surrounding the tower. As the less dense warm air rises up through the tower, denser cooler outside air is drawn into the bottom of the tower. In a mechanical draft tower, air flow is created by using one or more fans. An induced draft cooling tower uses the fans on top of the tower create an area of low pressure. This causes the air to flow in from the sides of the tower, up to the top. In this situation, water enters through inlet pipes and is spread out in troughs. Nozzles direct the water from the troughs on to packing inside the tower. The packing slows down the water as it falls through the tower it also breaks the water up into small droplets. Both of these actions allow for better heat transfer. As the water cascades down through the tower across the layers of packing, a fan draws the air in through a set of louvers, around the packing, and then through a drift eliminator. The drift eliminator traps water droplets that could be carried along with the air leaving the tower. The water is cool by the time the water reaches the catch basin. The cold water is then drawn out of the tower through the outlet line and returned to plant equipment for reuse. Another type of mechanical draft tower is the forced draft cooling tower. The major difference between an induced draft and a forced draft tower is that a forced draft our does not create an area of low pressure that draws air up through the tower. Instead, fans force or push the air up through the tower. Forced draft towers have no louvers on the sides, but rather fans with screens that direct the flow of air into the tower. As the cooling water cascades down from the top of the tower, the fans force air up through the tower and the heat transfer process takes place. There are some components that are common to most towers. For example many towers are divided into cells. Each cell contains all the components of a single tower, except they share a common catch basin. To better control cooling, each cell of a tower can be taken in or out of service independently. Other common components are blow down and make up lines. As the water in the tower evaporates the concentration of the impurities increases and can cause problems. To control the concentration of impurities, water is periodically discharged from the catch basin through the blow down line. This water is then replaced with clean water through the makeup line. The flow through the makeup line is controlled by a control valve which usually has a float that senses the level in the catch basin. As the level changes the float changes position and sends a signal to the control valve which regulates the flow of water in the system. 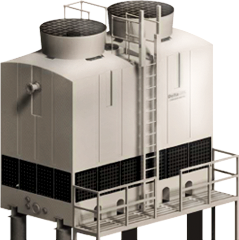 The Application Engineers at Mountain States Engineering and Controls are readily available to help you with any cooling tower question or problem you may have. They can be reached at 303-232-4100.